OK, the freesia is in bud and the orange tree covered with blossoms. But it’s cold and rainy here in San Diego, and my thoughts turn towards summer, especially summer fruit. 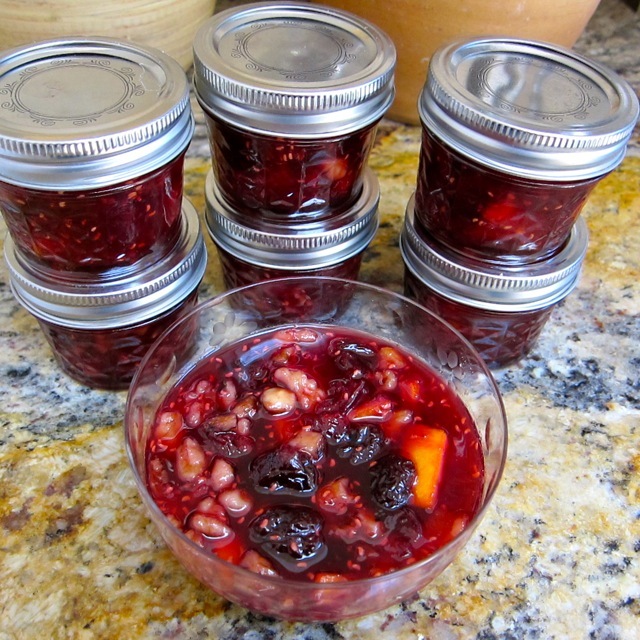 I love this old-fashioned recipe, “My Mother’s Cherry-Raspberry Conserve” . Basically, a conserve is a simple chutney with nuts, something you can whip up and serve along with a fish or chicken entrée. As an alternative, stir some into softened cream cheese for a snack with crackers or crisp veggies. There will be no fresh, local sweet cherries in the stores or markets until June, perhaps. I decided to experiment by using a bag of frozen sweet cherries from Trader Joe’s. Fresh raspberries are always available and I added grated fresh ginger root for some snap. The framboise is optional, of course, but adds a nice depth of flavor to the conserve. My mother only made this in the height of summer in eastern Pennsylvania. I still remember opening the family fridge and wanting to dive into all that glorious fruit, especially the raspberries, our favorite fruit. 1. Thaw the cherries, if using frozen fruit. 2. Using a medium-sized pot, mash the cherries and allow them to cook over medium-low heat until tender. 3. Add the dried cherries and fresh raspberries. Cook over low heat until mixture begins to thicken. 4. Chop the orange, including the peel, into medium dice pieces. Add to mixture. 5. Add the walnuts, sugar, lemon zest and juice and the ginger. Cook over medium heat until thickened, about 15 minutes. 6. Off the heat, stir in the framboise. 7. Store in fridge or ladle into sterile jars according to safe canning procedures. Place jars in a hot water bath for 10 minutes. Wonderful recipe, I so enjoy your Mom’s recipes. This is particularly delicious and can imagine how wonderful it is with fresh summer fruit. Thanks so much. I often wonder what my mother would think of her recipes being in a food blog, or if she even knew what a blog was! I think she would be honored and delighted, my Mom thank goodness is still with me and is tickled when I tell her I post her recipes. She doesn’t even use a computer and just got a cell phone a few months ago. I hope so – she didn’t “get” email but liked to see what I would do on the computer. This recipe has my name on it!!! I love, love the combination and can imagine how delicious it would be right now. Yes, this is a “Mary” recipe for certain! This sounds fabulous. So full of flavor! Thanks, Lynda – enjoy the weekend. looks like it would be good over ice-cream and it was a beautiful summer day today. Ice cream sounds good…Say,I love my new lime thyme and Irish lace thyme. Experimenting growing them in pots. This looks delightful Liz, I too am a fan of your Mom’s recipes 🙂 I love cherries and raspberries together and I am going to try it with my Chambord which I always have on hand. Strange, Wendy, I had forgotten until now that she loved Chambord! She visited me when Charles and Diana were married and we had a toast at 2 in the morning – with your Chambord! @Lizthechef I love the combination of cherries and berries…this sounds soo delicious! This recipe sounds gorgeous, and I know exactly how I’m going to use it. Love the idea of cherries and raspberries together. Wonder what you will do with it, Steve? I was lucky enough that you shared this recipe with me before and I can vouch for how delicious it is! I left out the nuts to make it husband friendly and he too enjoyed it, in fact both of us are fans of your Mother’s recipes! Thanks, Jayne – she would be so pleased to know I have a good friend in London, just about her favorite place. Love this recipe, Liz! So simple, versatile and I bet absolutely delicious. Thanks for sharing. You have a very nice blog and I’m glad to have found you! Thanks – looking forward to visiting your blog now! This worked so well with frozen cherries – I couldn’t taste the difference, Susan. Thanks – glad you are back in your kitchen.